A custom commercial awning will protect your business from the elements and provide a great, long-lasting advertisement! A commercial awning can protect your business from the weather elements, while also providing a standing advertisement that will last for years to come. When it comes to an awning for your business, you want it to stand out from the rest and only for good reasons. That is why a custom awning is a great choice, leaving you with endless design options. Here are some tips for designing a custom awning for your business. Before you start investing the money into your custom awning, you want to have a vision in mind. Because there are so many options to choose from, it is important to have a plan in order to keep your design and budget on the right track. 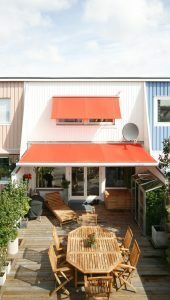 You may want to look at other awnings in the surrounding area for inspiration or just to get an idea of the competition. You want an awning that is unique, eye-catchig, and has the name of your business printed on it. Having pictures or drawings of what you are looking for will help the professionals to create the perfect custom awning for you. Designing a custom awning is no easy task and requires certain tools and training. You want to make sure that the person who is creating your awning is experienced in their craft. A good awning specialist will be able to help you complete the ideas that you have and create the awning that you have been dreaming of. A custom awning that looks beautiful does not matter if it can not withstand various weather elements. You want the best quality for your money, so make sure that you are investing in durable materials and not just going for what looks the best. Awning materials vary from aluminum to wood to fabric. Your choice of material should be based on your specific needs and desires. Each material comes with its own pros and cons, so make sure that you talk to the specialist about the options that you have before making a final decision. Call Carroll Awning Company Today For Your Custom Awning!